The man named his wife Eve because she was the mother of all living, and because “Matrilineal Most Recent Common Ancestor” was too long of a name. Yahweh saw that the man’s loin cloth fluttered in the breeze, and he thought that was gross. So Yahweh made garments of skins for the man and his wife, and he clothed them. And Yahweh was full of joy, for he himself had felt firsthand the thrill of shedding blood. At that moment, Yahweh resolved to make many, many rules about killing animals and doing things with their blood. 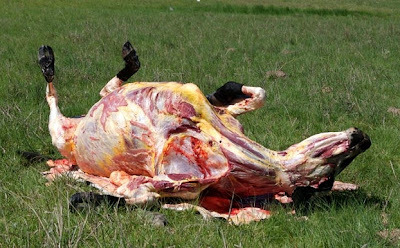 And lo, the man and woman were in shock, for they had seen their divine creator skin a poor cow and discard its carcass in order to make clothes for them. Yahweh was surprised at their reaction, but he thought enough to skin two lambs in order to make blankets to cover them. And now the whole heavenly host was in shock. As he was sewing the skins into blankets, Yahweh pricked his fingers several times, causing him to use his name in vein. When he finished, Yahweh ripped a rabbit’s ears off of its head, and that helped him feel a little better. Yahweh briefly considered - but then rejected - pruning the tree of life. 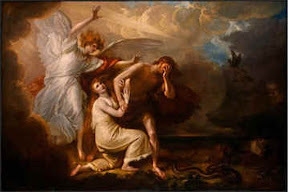 Instead, he picked up the man and woman and placed them out of the garden of Eden to forever till the ground from which the man was taken. The ground of death. And at the east of the garden of Eden, Yahweh placed the cherubim to guard the way to the tree of life, for the cherubim were indeed truly creepy and none who looked upon them would desire to come any closer. But just to be certain - and to add a little flair - Yahweh gave the cherubim a flaming sword that turned in all directions in order to guard the way to the tree of life. 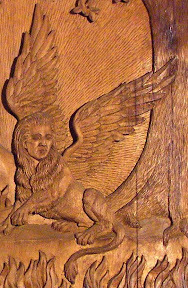 And Yahweh was indeed pleased that he took for himself the cherubim from Egyptian mythology. Lo, he was even more pleased to be rid of some of them, for yea, they were so damn creepy.